Newark as a cultural center would be the envy of any state or region, for within a mile's radius is the state's largest public library, museum, historical society, symphony orchestra, boys' chorus school, and jazz matrix consisting of the world's largest jazz collection, a radio station devoted to jazz performances, and the site of a national jazz festival. All of these civilizing goodies sit next to College Town or University Heights with its tens of thousands of students, faculty members, and research facilities. Just down Broad Street stands the city's government center with city hall, three federal court houses and related federal facilities. Across town, at Springfield Avenue and West Market, is the massive governmental megacomplex which includes the county courthouse, hall of records, courts building, prison, parking center, and vocational and technology training center. But of all the great constituencies that make Newark vital, it is the cultural agencies that are the most conspicuous. At the Newark Public Library, which houses a 1.2 million volume collection, assisting users in finding research information has been a longtime tradition. Thousands and thousands of inquiries are handled each year. In addition to its nationally important collections in art, music, business, New Jersey information, United States and New Jersey documents and patents, the library recently opened a new technology center and placed increased emphasis on exhibitions and public programing. The library's renaissance has not been restricted to its central research center, for work continues as well on rebuilding all of the neighborhood branches by the millenium, earlier if the money to meet that goal is forthcoming. The recent $25 million renovation of the internationally famous Newark Museum was completed upon its 90th birthday. John Cotton Dana, its world-famous founder, who was also a librarian at the Newark Public Library, must certainly have been smiling down from somewhere when a recent exhibition, 'Jeweler to the World, The Glitter and the Gold: Making and Marketing America's Jewelry, 1875-1929,' opened to rave reviews. Dana wanted the museum to be a showcase for all. With this in mind, the building was designed for the average person and built in the very heart of the downtown district as opposed to being a Greek temple isolated in a closed setting open only to the elite. While works of New Jerseyans and Americans tend to dominate the collections, the museum houses one of the world's best Tibetan collections. The temple altar was dedicated by the Dalai Lama. Louis Bamberger, the department store magnate, funded the museum building and also paid for the renovations of the museum garden and the Lyons Farms School House and the Carriage House/Firemen's and Ballantine House on the museum grounds. Even the recently added parking lot was treated as part of the museum megastructure complex designed by noted architect Michael Graves and orchestrated by Museum Director Emeritus Samuel Miller. The New Jersey Historical Society was founded in 1845 in Trenton, but moved to Newark the following year to be part of Newark's cultural scene ever since. While the society has had several different homes in the city, its recent move to Park Place, former home of the old Essex Club, has put it in the absolute heart of Newark's cultural activities. As the state's oldest cultural agency, the society continues to live up to its responsibilities 'to discuss, procure, collect and preserve that which relates to the history of New Jersey, and to disseminate to its members and the general public knowledge concerning the same, without profit and solely for their benefit and advancement.' To accomplish these goals, the New Jersey Historical Society publishes information both for the historically curious and the scholarly, operates one of the nation's best historical research libraries and maintains an outstanding museum with a growing number of exhibitions. Part of the fame of the society's library rests upon the more than 200,000 manuscripts, 50,000 volumes, and over 1,000 rare maps in its collection. The New Jersey Symphony Orchestra was founded in 1922,75 years ago, during a series of musical mergers. It is celebrating its rich three-quarters of a century history by opening its new season at the New Jersey Performing Arts Center at Newark. As its name suggests, the orchestra is a truly a state-wide organization, having seven regional homes around the state. Its musicians have appeared in all of New Jersey's 21 counties as well as having appeared in more than 200 concert halls, churches, synagogues, auditoriums, sports arenas, and even open fields. For a good portion of its existence, the orchestra was based at Newark Symphony Hall (originally the Mosque) on south Broad Street. Since its inception, the orchestra has been directed by a dozen conductors and has employed women in a major roles as 'players, participants, and patrons.' The orchestra's present maestro, Zdenek Macal, has brought the institution to the nation's musical forefront, building on the work of previous directors such as Henry Lewis, Hugh Wolff, and Thomas Michalik. Prospects for the organization brightened as ticket sales nearly doubled over last year amid preparations for the new hall and a new season. On South Broad Street also is a former neighbor of the New Jersey Symphony – the Newark Boys' Chorus School. In fact, the chorus was started by the New Jersey Symphony Orchestra because of the need for a musical group to accompany the holiday performance of the 'Nutcracker Suite.' The Newark Boys Chorus School is now a fully independent organization whose students function as 'Newark's good will ambassadors, ' according to Mayor Sharpe James. Located at 1016 Broad St., the school includes boys from grades four through eight, and presently has an enrollment of approximately 75 five students. The school's administration believes strongly that it 'offers inner city children a chance at survival by providing a very thorough and basic education which parents particularly need in an urban environment.' Scholarships are available for qualified students following an academic examination and musical auditions. While many of the nearly 70 concerts given during the year are in the metropolitan area, the chorus also has performed for the Pope during a tour of Italy and appeared throughout China, Japan, and Australia. Jazz also occupies an important part of Newark's cultural spectrum. For many years, radio station WBGO has been part of the community's voice as one of the nation's leading jazz exponents. In 1951, Marshall W. Stearns founded the Institute of Jazz Studies in his New York apartment. In 1967, he moved it to Rutgers-Newark University, where it has grown into one of the world's largest jazz collections. 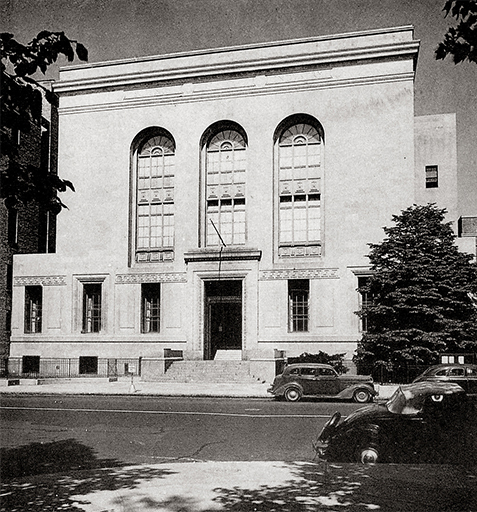 First located in Bradley Hall on the Newark campus on King Boulevard, it is now housed in the Dana Library and contains 100,000 records from rare early cylinders to a variety of current materials including all types of recordings, books, and periodicals. Oral history has also become an important part of the institute's collection as well as a series of popular and scholarly publications. The Newark Jazz Festival, originally the Sarah Vaughan Jazz Festival, was established in 1991 by Dr. Alex Boyd, the director of the library and festival president. The prestigious event, which takes place every fall, includes performances of every type of jazz and dozens of free concerts in halls, restaurants, and clubs, as well as at Newark's Penn Station, the library and the museum. With the October 18 opening of the New Jersey Performing Arts Center, Newark's and New Jersey's precincts of cultural agencies will be complete. Compared to Washington's Kennedy Center, and New York's Lincoln Center, it is one of the three major performing complexes on the East Coast. Not only will it serve as the state's cultural mecca in popular and classical music and dance, it is expected to have a major economic influence as well. One projection in The Star-Ledger estimated that by the year 2003, the $180 million investment will have generated more than $1 billion in profits throughout the general and immediate community. Established as a nonprofit corporation, the arts center is located on a 12-acre site between Military Park and McCarter Highway, financed by a combination of both public and private dollars. Major donors included Prudential, the Samuel I. Newhouse Foundation, the Victoria Foundation, AT&T of Bedminster, and Merck of Rahway. Funds came also from thousands of individuals who purchased individual bricks for $100 each. Prudential Hall seats 2,750 while the Victoria Theatre can accommodate 500. Two restaurants are located in the complex and a great domed lobby and Founder's Hall are available for public as well as private events. A 1,000-car garage is available at the recently renovated Military Park garage, and a new 500-space facility is located across from the front door. A new rapid transit system in the future will make access to the cultural facility easy. New exit ramps from Rt. 280 have been completed, and new street and directional signs have been installed throughout the state and along major state highways leading to Newark as well as on city streets. As the houselights dimmed and the curtain rose for the first time, the New Jersey Performing Arts Center became part of a group of prestigious cultural organizations that promise to contribute significantly to a new and very dynamic 21st century American city.